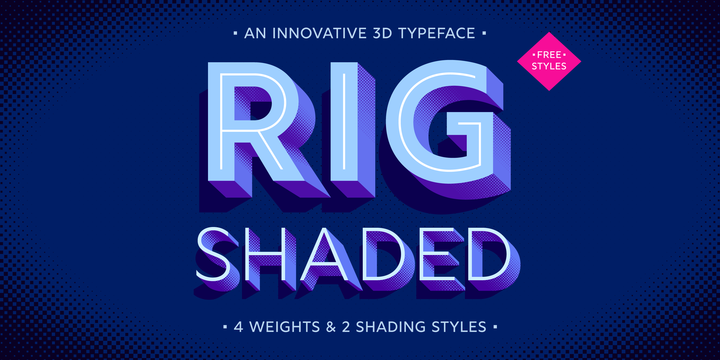 Rig Shaded is an innovative 3D typeface published by Jamie Clarke Type. This geometric sans serif font is available in 4 wights (Light, Medium, Bold, Zero) and 2 shading styles (Fine & Coarse). The Fine grade shading suits larger headlines while the Coarse grade is designed for smaller titles or to create a distinctive texture. It comes in 230 glyphs, 5 layer styles (Inline, Face, Shandind, Extrude, Shadow) which can create stunning effects and almost 200 language support. It is ideal for brunding, display, logo, packaging, poster, signage etc. Have fun! Price: starting from $10 for one font to $80 for all 20 fonts. A font description published on Tuesday, March 14th, 2017 in Fonts, Jamie Clarke, Jamie Clarke Type by Alexandra that has 4,251 views.